350 Sonoma, following the lead of the Legislative Committee of 350 Bay Area, tracks key environmental bills in the California Legislature. 350 Sonoma has launched a new action group to monitor and respond to state legislation related to climate issues. 350 Bay Area’s Legislative Committee, working with other state-wide environmental groups, monitors legislation and helps coordinate actions among local groups on particular bills. 350 Sonoma is in the process of building relationships with our state legislators so that we can more effectively influence their votes. 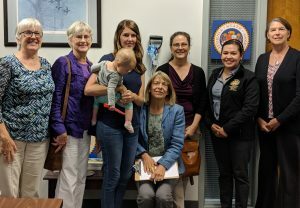 A small team from 350 Sonoma and 350 Petaluma (our new subgroup representing the south county) will be meeting on May 15th with a member of Assemblymember Marc Levine’s staff. We’ll emphasize the critical importance of quickly achieving 100% clean energy in California. SB 100 is the current legislation mandating 100% clean energy, and it is currently stalled in the State Assembly after passing the State Senate. If SB 100 doesn’t make it out for a full vote this year, we will keep working to get it back into the legislative process. We will also ask for Levine’s vote on AB 3232, a bill that will promote the shift to all electric buildings. Other bills we will ask for AM Levine to join us in supporting: 2304 – atransit pass study, 1775 – to limit offshore drilling, and 2928 – promoting dense housing on BART properties. A million thanks to Kathy Dervine, Judy Pope and the 350 Bay Area Legislative Team for their leadership and guidance. 350 Sonoma will be setting up a meeting with Jim Wood as soon as the dust settles on this one.